Sarah Alyce size 6-12-18-24mo and 3/4 all in one pattern! 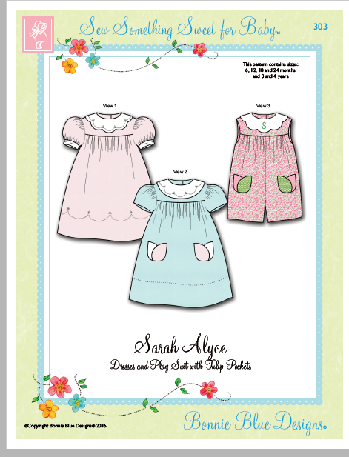 Creative Sewing & Smocking > Patterns > 1-A-J Designer Names > Bonnie Blue Designs > Sarah Alyce size 6-12-18-24mo and 3/4 all in one pattern! Sarah Alyce dress and play suit with tulip pockets and scallop or round collar. Puff sleeves with band or cap sleeve options. Detailed instructions and illustrations are included for quick and easy construction. Embroider designs and complete embroidery stitch instructions included. Collar is also ideal for machine embroidery!